Retaining talented employees is the key to growing a sustainable business in the long-term. They’ll bring their expertise and your way of doing business to cultivate long-term relationships in external communication with clients, but also in communication around the office - sharing knowledge with coworkers and mentoring new hires. So why is it so hard to keep talented employees from decamping to new companies? Bâton Global has extensive experience in creating strategic programs on behalf of clients to promote organizational commitment and curb turnover. What are some of the common challenges in retaining talented employees and how can they be effectively managed? Most firms’ retention strategies revolve around improving job satisfaction. However, a comprehensive 20-year overview of meta-analyses on turnover revealed that low job satisfaction was only the 5th strongest predictor of turnover. The top four predictors were turnover intentions, job search intentions, job search behaviors, and thinking of quitting. These four predictors are part of the withdrawal process workers go through as they develop intentions to leave. Job satisfaction, often, may not be a factor in this process. Thus, focusing solely on improving job satisfaction will not result in an effective retention strategy that curbs employee turnover. Bâton Global creates strategic retention programs that go beyond what “pushes” people to leave – like low salary and low job satisfaction – and also considers the “pull” factors that prevent workers from developing and acting on their intentions to leave. Pull factors are what creates a feeling of embeddedness for workers in their organization. Workers that feel embedded are interconnected to others in the organization and have taken initiative to build relationships. Among these workers, turnover is less likely. To cultivate commitment to the organization and community, firms should focus on the three pillars of job embeddedness – Links, Fit, and Sacrifice. Links are the connections with other people in the organization and surrounding community. These can be with coworkers, mentors, or friends in the community. To foster links, firms could plan social functions outside of work for employees to bond with their coworkers and surrounding community. By developing relationships with others, workers feel more connected to the workplace and community. Most employees’ work is important to them, but they also have lives outside of work. By fostering links, your employees’ lives will be more satisfied and as a result they’ll be more likely to stay. Fit is the compatibility of the worker with their job, organization, and community. To foster fit, firms could arrange personalized mentorships for workers to ensure responsiveness to their individual needs. By fostering fit, your employees will feel more in-tune with the organization and their job. Sacrifice is the awareness of the tangible and intangible losses workers would incur by leaving. 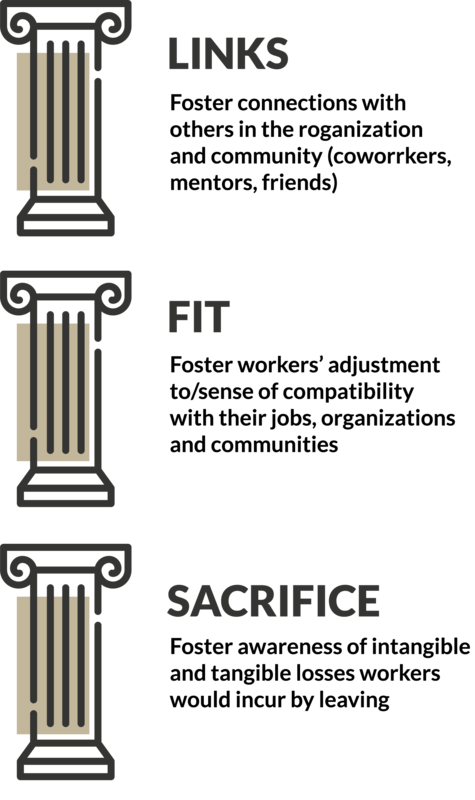 Because sacrifice is both tangible and intangible, there are many ways to foster it. Increasing compensation and providing benefits packages is a tangible way to foster sacrifice. Intangibly, providing ample opportunities for workers to see their family and create a good work-life is a nice way to make workers feel less like they are making steep personal sacrifices to work at your firm. Bâton Global’s clients have realized higher organizational commitment and reduced turnover among their workforce. How can we help improve organizational commitment and retain top talent for you?